Van Johnson week closes – or lies dormant until his Summer Under the Stars day – with his role in a remake of a popular Jimmy Stewart Christmas classic! A turn-of-the-century remake set in America of The Shop Around the Corner (1940), In the Good Old Summertime is an effectively charming film that, in many regards, I enjoyed more than the original. Blasphemy, I know. Veronica Fisher and Andrew Larkin (Judy Garland and Johnson) are two employees in a music store who can’t stand each other. But, they’re unwittingly in love with each other because they’re the other’s anonymous pen-pal. Originally entitled The Girl From Chicago, In the Good Old Summertime started out as a project for Frank Sinatra and June Allyson. Sinatra dropped out, leading to a string of new actors including Allyson’s Good News (1947) co-star Peter Lawford. When Allyson became pregnant she left the film. 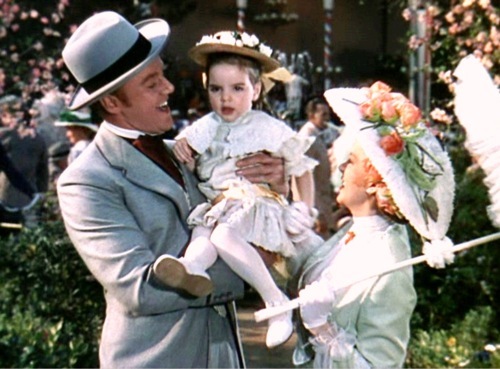 MGM saw an opportunity to put in their workhorse A-list star, Judy Garland. Garland was fed up with the studio and this would be the second-to-last film she starred in for them until her return in 1956. Maybe because Jimmy Stewart isn’t my bag, but many of his iconic works suffer from hype fatigue for me, whether it’s It’s a Wonderful Life (1946) or the earlier interpretation of this feature, The Shop Around the Corner. My original review doesn’t coherently sum up my distance from the film, so I should probably give it a second glance. As for In the Good Old Summertime, MGM’s desire to capture lightening in a bottle is apparent. Garland in turn-of-the-century Midwest America? Don’t be surprised to see a few nods to Meet Me in St.Louis (1944), so much so that laziness seeps in to Garland’s performance and how Robert Z. Leonard directs. The opening song’s melody immediately reminded me the Smith family’s title song. But that isn’t the only reliance on a past Garland success. Veronica is brought to town by man she’s talking to through letters, drawing an unintentional similarity to The Harvey Girls (1946). And what’s up with the title? “In the Good Old Summertime” comes from the title of a popular song, but the film takes place during the winter leading up to Christmas! Talk about false advertising. Removing the original film from the discussion, In the Good Old Summertime is a lightweight MGM musical. 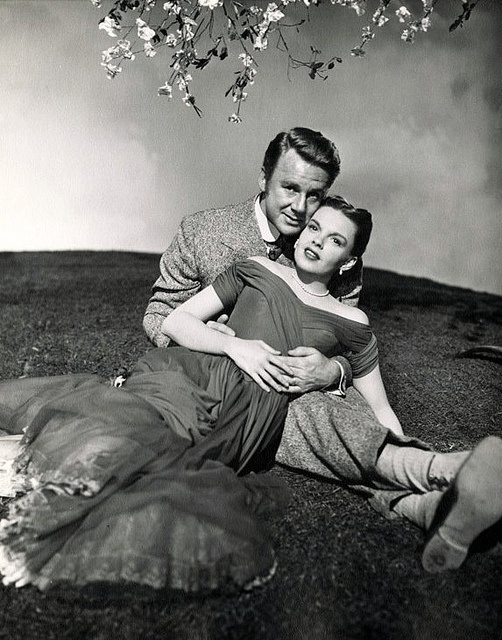 Van Johnson’s imitation of Stewart is spot-on, although he continues the trend of placing Garland opposite actors that had less flair than she did. (Johnson’s more John Hodiak than Gene Kelly.) However, Johnson and Garland have wonderful chemistry together. The two perform a duet reminiscent of the “You and I” song from St. Louis if Mary Astor and Leon Ames abused each other while singing. Veronica slaps Andrew in the head, a moment that could have been improvised for how spontaneously it happens, while Andrew takes Veronica off-guard by playing the song with a quicker tempo. Though Garland is the main draw for most, Andrew is the larger character. He narrates the film, and many events are seen through his eyes, including Veronica’s arrival at the store. Johnson proves he’s got some sexuality in him when he nuzzles up to Garland at the end to declare his love, but their relationship is predominately of the “opposites attract” variety. Judy looks fantastic and her performances – especially the oft-memed “I Don’t Care” – are fun, but the fatigue is evident; there’s no glimmer in Garland’s eye and during the musical numbers there’s a slight robotic quality. Judy couldn’t have left MGM fast enough. Spring Byington returns after seeing her in the other Johnson pairing this week, Thrill of a Romance (1945) and where she was left holding a telephone in the previous film she’s a full supporting player as Nellie Burke. Her and S.Z. “Cuddles” Sakall, foils to the romance between Andrew and Veronica, are older lovers going through the motions. Byington is so cute while Sakall is the bumbling owner of the music store Andrew works at. The latter gets a rare chance to stretch his acting chops in a moment of high drama. Sakall’s Mr. Oberkugen possesses a Stradivarious violin he treats so preciously you’d think it was a child. When he believes Andrew is responsible for breaking it, he’s forced to fire him. While penning a letter of recommendation Mr. Oberkugen plaintively thinks back about the boy he considered a son, maybe even more beloved than his violin. Buster Keaton makes a comeback as the bumbling shopboy Hickey, whose violin “fall” proves he’d lost none of his spark by the end of the ’40s. Violin player Marcia Van Dyke plays Andrew’s “lady friend” Louise, and her character Louise superfluously moves the plot forward although we’re unclear how Andrew and her are connected. The possibility arises of her being set up as a romantic rival for Andrew, but there’s no hint of romance or even connection outside of the immediate scenes she’s in. There’s plenty of good found in In the Good Old Summertime. Garland and Johnson are fun, and the side characters are well-integrated. This isn’t the most enduring feature MGM ever put out, but it’s a solid watch in the moment. Wow. I couldn’t disagree about Garland’s performance, co-star – or eyes – more. You say Johnson doesn’t have her “flair”, yet in the sentence before it, you say how good he is in the film. Huh? Few people had Garland’s flair, and not every co-star had to be Mickey Rooney, Kelly or Astaire. And John Hodiak was one of the hunkiest leading men Garland ever had (he sang decently too, if you ever catch their unfortunately cut “My Intuition” from “The Harvey Girls”). I think Garland’s eyes sparkle, and she looks far healthier in this film than she does in the more classic “Easter Parade.” And I don’t see a shred of “laziness” in her work here at all. It’s one of her most ironic, comical, and romantic turns. The film is delightful, and while it may not be a super Garland classic, it carries one of her best performances.